U San Tha Aung is a native of Arakan State (Burma). He passed B.Sc (Hons) in Physics from Rangoon University and A.M. in Physics from Harvard University. Served as Professor of Physics, Arts and Science University, Rangoon until 1970. Since then he is serving as the Director General of Higher Education. Ministry of Education, Burma. Author of “Things ought to be known about Physics;” “Computer;” “Atom and Nuclear Energy;” “Selected scientific topic on functions of present-day utilities;” “Scripts of Arakan, 6th century and before;” “Anandacandra, King of 8th century Vesali of Arakan” and “Arakanese Coins” (all in Burmese). The Arakan State is situated on the boundary of Bangladesh and Burma. It is a constituent unit of the Socialist Republic of the Union of Burma. It is separated from Burma proper by a range of barrier against inter-communication between the people living on either side of it. Though descended from the same stock, worshipping the same faith and speaking the same language as the Burmese, the Arakanese have witnessed the flowering of a distinct culture, and have preserved a distinct dialect. In olden days, Arakan was a thriving, independent ancient border state beyond ancient India. Situated east of Vanga and Sematata. Indologists, writing about the history and culture of ancient India, never mentioned this area where high standards of living, culture and art flourished. The present work is an attempt to fill the missing link between ancient India and Burma proper by presenting a few aspects of the rich cultural heritage of Arakan. Images in stone and bronze, representing the Buddhist Art of Ancient Arakan (before 1000 A.D) are presented in this book. A Fat Monk image, miniature stupas, a tablet of auspicious symbols, dedicatory inscriptions fallen out of old ruined stupas and caityas, a relief sculptures found on the platforms of the Mahamuni Shrine are all sculptured out of, or inscribed on stones. The miniature cetis (caityas), bells, lamps and numerous Buddha images, crowned and uncrowned, are all made of bronze. These bronze artifacts provide evidence of all made of bronze. These bronze artifacts provide evidence of a flourishing school of bronze castings. The time of casting ranged from the 5th century A.D. to the 10th century A.D. I have presented many varieties of bronze Buddha images, both crowned and uncrowned, of Arakan having different gestures. I have also explained these gestures one by one. Any one who is interested in Buddhist iconography, I hope, will be able to find in the images I have presented, new types and variations till now unknown to them, and also remarkable affinities with those that they are more or less familiar with. In both cases, I fervently hope that, a really interested mind will have much to take delight in. These Buddha images, covering a period of nearly five hundred years, recorded the artistic achievements of bronze-casters from the period of experimentation ( 5th century A.D) in the well modeled graceful figures of the last period. The metal caster's art, especially in the fashioning of crowned Buddha images, remained throughout at a high level. The pictures of these images, which I have presented in this book, amply testify to the truth of my remarks. Although the Mahamuni Sculptures represented the earliest group of the Buddhist Art of Arakan, they are described in the last chapter of the book for reasons which will become apparent after reading the Chapter on “Buddhism in Arakan”. I want to record my gratitude to those who assited me in one way or another in writing this book. To Sao Hso Hom formally of the Higher Education Department, for the pains he took in carefully reading the whole text and suggesting many corrections. To U Tin Oo, Chief Editor, Universities Translation and Publication Department, my friend and colleague, I am very deeply indebted for preparing all the photographic works in this book. The publication of this book would not have been possible without his generous help. To U Thaw Kaung, Librarian, Universities Central Library, for all the help he kindly gave me in searching for reference materials. To Daw Sein Sein New of the University Correspondence Courses Department for typing the whole manuscript. Arakan State is situated between proper on the east and Bangladesh on the west. It extends from Lat. 21˚ 20' N at its northernmost limit to Lat. 16˚ N at Pagoda Point, its southern extremity. From west to east it extends from the Naaf River at long. 92˚ 20' E to the crestline of the Arakan Yoma at long. 95˚ 20' E. See Map I and II (pictures). The latitudinal and longitudinal extensions given above do not give a true idea of the present day Arakan, because it is mostly a narrow coastal strip. The only area where there is space to speak of is the area around Akyab which formerly was the centre or nucleus of the ancient Arakanese kingdom. See Map III (picture). The early history of the Kingdom of Arakan up to 1000 A.D.
Up to now historians have largely neglected Arakan. This is mainly due to its geographical position on the boundary of India and Burma. 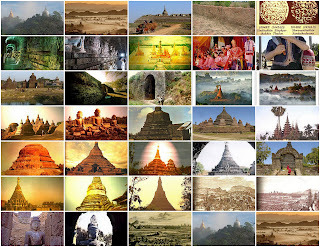 Burmese historians have directed their efforts to elucidating such facts as can be ascertained about Burma proper, and the Burma Archaeological Service have not undertaken any serious excavations in Arakan. Indologists on the other hand have shown little interest in an area in which, even at period dealt with here (up to 1000 A.D), Indian Civilization was not a natural product, but was something imposed on the country from without. About forty years ago, all that was known of the early history of Arakan up to 1000 A.D. was the dynastic lists given in the local chronicles. The lists of kings began with those who were dated from about 3000 B.C. The first king mentioned was Marayu. He was the son of a prince from Kapilavastu who must have been driven into this region on political grounds. Marayu married the daughter of a powerful prince came of age he led the whole of his mother's tribe, as well as all his father's followers from India and conquered Arakan. He founded the first city of Dhanyawadi. His descendents numbered fifly four kings among them. Then came Kanrazagri and his twenty eight kingly descendents. He founded the second city of Dhanyawadi. The dynasty founded by Kanrazagri was succeeded by the Suriya kings the first of whom was Canda Suriya. He founded the third city of Dhanyawadi. According to the chronicles it was during his reign that the Buddha visited Arakan with his five hundred disciples. It was mentioned that the famous Mahamuni image (which is at present in Mandalay) was cast with his consent as a memento of his sojourn in the country. A palm- leaf manuscript entitled, Sappadanapakarana, provides a detailed accound of the casting of this image. The Suriya dynasty consisted of forty eight kings and was succeeded by the Candra dynasty. The founder of the Candra dynasty was Maha Taing Candra. He ascended the throne in 788 A.D. and built the city of Vesali which he made his capital. Vesali collapsed due to the invasion of the Shans in 957 A.D. Though under unsettled conditions it continued as capital till 1018 A.D.
At present other evidences rather than the chronicles are available to elucidate the early history of Arakan. Epigraphic and numismatic materials are now available. They are the prasastis, the votive inscriptions, the copper plate land grant, the bell inscriptions and numerous early coins struck for the purpose of currency. Out of these the most important one being the Anandacandra Inscription inscribed on the west face of the pillar now at the Shitthaung Pagoda at Mrauk-Oo, Arakan. See picture. It is a prasasti of king Anandacandra who ruled Arakan about 720 A.D. See picture. It had been dated on palaeographic grounds to the beginning of the 8th century A.D. by Dr. E. H. Johnston, and Dr.D. C. Sircar. Dr. Johnston was the first to read the inscription fully. His readings reveal a list of kings which he considered to be reliable from the beginning of the Candra dynasty. The first part of the inscription contain three sections quoting the names of the kings who were believed to have ruled over the area before Anandacandra, together with the duration of their reigns. The first of these three sections deals with certain kings who altogether ruled for a total of 1016 or 1060 years. The beginning of this section is damaged; but, as all the five kings at the commencement of the extant portion are stated to have ruled for 120 years, it is clear that this section (or at least the earlier part) is mythical. We may refer to this section as the 1st period. The second section deals with the candra kings, sixteen of whom are stated to have ruled for a total of 230 years. The list, however, enumerates only thirteen names although their reign periods as quoted in it come up to 230 years. This is possible because three kings of the dynasty, who may have ruled for a few weeks or months, were omitted from the list. We may call this section the 2nd period. The last of the three section deals with the family to which Anandacandra belonged and quotes the names of his eight predecessors stated to have together ruled for 119 years and 9 months. We may call this section the 3rd period. The second part of the inscription is an eulogy of Anandacandra recounting the king's pious activities in the first nine years of his reign. From this can conclude that the inscription was apparently engraved in the ninth year of his reign. He was evidently a Buddhist by personal religion and he calls himself an upasaka, but following the Buddhist tradition of religious tolerance he did not neglect the Brahmas in his display of liberality. The candra dynasty metioned in the second section began in the middle of the fourth century. Out of the list of thirteen kings of this dynasty we are now in possession of coins struck by nine kings. See pictures. Go These early coins are all of silver. They seem to have been issued in three or four denominations and to have been struck to certain weight standards. They were coined to serve as currency. The patterns on the coins persist without major changes for about 600 years. This is further proof that the coins were used as currency. In addition to the nine different coins belonging to nine different kings of this dynasty of the 2nd period, two epigraphic records of kings Niticandra and Viracandra were also found at the Vesali site about the year 1956. See picture. Go This Candra dynasty came to an end with the king Dhrticandra. Taking the time estimate of Dr. Johnston and Dr.Sircar, this would have happened about the end of the 6th century. After them, there seems to have been trouble in the area. The 3rd period begins with king Mahavira who may have come from another kingdom (Purempura). For the next fifty years or more, it seems none of the rulers were able to establish a dynasty. Johnston calls this the confused period in early Arakanese history. The names of the two kings on the list of this period tallies with the coins found in that area. They were Dhammawizaya and Dhammacandra. See picture. The north face inscription of the pillar at Shitthaung Pagoda, Mrauk-Oo was, according to Dr. Johnston, written in a Bengali script of the 10th century A.D. The letters in the script are badly cut and vary considerably in shape. The inscription amounts to sixty nine lines, when counted on the right side. Parts of them are entirely gone; the rest is written in a slipshod hand, and the rubbing itself seems to have been inefficiently done so as to make reading of it chancy. There appears to be at least three inscriptions, all in much the same script. According to Dr. Johnston, a competent epigraphist, working on the stone instead of the rubbings, should be able to produce a fair reading of the inscriptions. He concluded that North Arakan again produced in the tenth century a dynasty of some importance. The history of Arakan for the period between Anandacandra and the 10th century will be enlightened if these inscriptions of the north face of the pillar are properly deciphered. A number of the coins that fall within this period have also been found. The most notable one being that of king Sri Simghagandacandra. See picture. By studying the writings on this coin palaeographically we can place this king's rule about the end of the ninth century or the beginning of the tenth century. 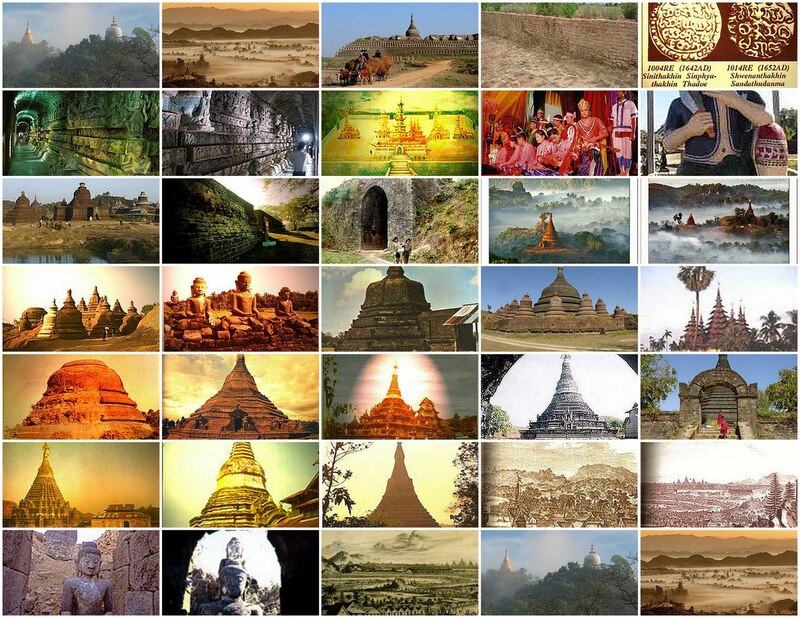 This is all that we know about the history of ancient Arakan. The standard of culture and the civilization of the people residing in the country during this period can be judged from the silver coins they used a currency and the religious art which I am presenting in this book.